Award-winning political reporter joins the Wallace House program. Wallace House is pleased to announce the addition of award-winning political reporter and Knight-Wallace alum, Molly Ball, to the Livingston Awards’ judging panel. A prominent voice on U.S. politics, Ball serves as National Political Correspondent for TIME, covering the Trump administration, the national political climate, personalities, policy debates, and campaigns across America. She is also a political analyst for CNN and frequent television and radio commentator. Prior to joining TIME, Ball was a staff writer covering U.S. politics for The Atlantic. She previously reported for Politico, the Las Vegas Review-Journal and the Las Vegas Sun. 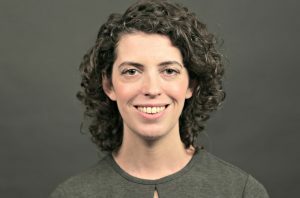 She has worked for newspapers in Ohio, Pennsylvania and Cambodia, as well as The New York Times and The Washington Post. “Molly Ball brings a keen, intuitive eye and astute sensibility to everything she approaches,” says Lynette Clemetson, Wallace House director. A graduate of Yale University, she was a 2009-2010 Knight-Wallace Journalism Fellow at the University of Michigan. Ball grew up in Idaho and Colorado. She lives in Virginia with her husband and three children. The regional judges read all qualifying entries and select the finalists in local, national and international reporting categories. In addition to Ball, the regional judging panel includes: Stella Chávez, education reporter, KERA public radio (Dallas); Chris Davis, Vice President of Investigative Journalism, Gannett; David Greene, host, “Morning Edition,” NPR; Stephen Henderson, host, “Detroit Today,” WDET; Shirley Leung, columnist, The Boston Globe; and Raney Aronson-Rath, executive producer, “Frontline,” PBS. The Livingston Awards national judges review all final entries and meet to select the winners in local, national and international reporting. The national judging panel includes: Christiane Amanpour, chief international correspondent, CNN, and host of “Amanpour on PBS,” PBS; Ken Auletta, media and communications writer, The New Yorker; Dean Baquet, executive editor, The New York Times; John Harris, editor-in-chief and co-founder, POLITICO; Clarence Page, syndicated columnist; Anna Quindlen, author; María Elena Salinas, host, “The Real Story with María Elena Salinas,” Investigation Discovery; Bret Stephens, op-ed columnist, The New York Times; and Kara Swisher co-founder and executive editor of Recode. The Livingston Awards is now accepting entries for 2017 work. Entry deadline in February 1, 2018.